Great news – our shiny new website is now live and we hope you find it user friendly and informative! Please bear with us over the next few weeks as there are bound to be some minor hiccups along the way as we finalise and refine the content. 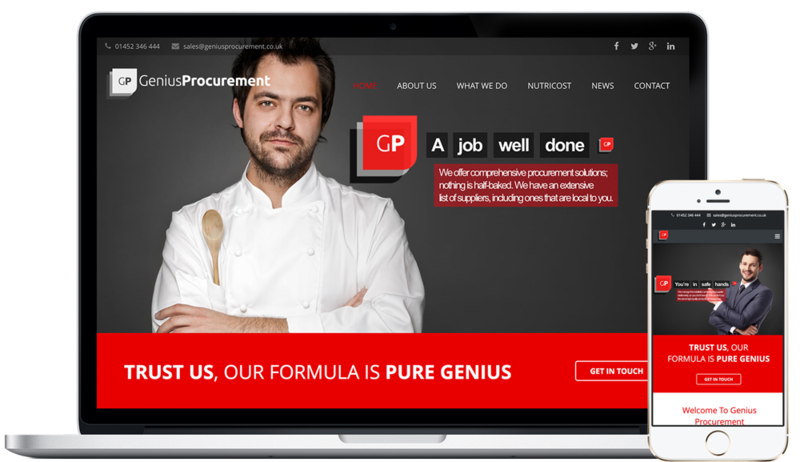 Having worked closely with Nettl of Gloucester over the past couple of months, we are happy to reveal a new, online presence and information hub for everything related to Genius Procurement. The responsive design of the new website means that, not only will you be able to access it from desktops and laptops, but also tablets and smartphones. Now you can see the full extent of our procurement service, and the vast number of industries we cover. If there are any updates to our service or systems, you will be the first to know by accessing our ‘News’ section; but also, we will be actively sending out newsletters, and we’re sure you will be prompted to subscribe at some point – if you haven’t already! All users of our acclaimed Nutricost system will be able to sign in and access their account and manage their resources by visiting our homepage. Everything we can think of that you would want to know about us has been included on the website, but if you have any more questions, feel free to email or call us and we will be happy to help – just visit our contact page.